Wisco's new 561 digital 16” commercial, deluxe pizza oven featuring a rotary dial design that allows you to easily set it with just a turn of the dial. This digital pizza oven oven also features a 30 minute digital display with “HOLD” option and a one-touch setting with time & temperature memory. 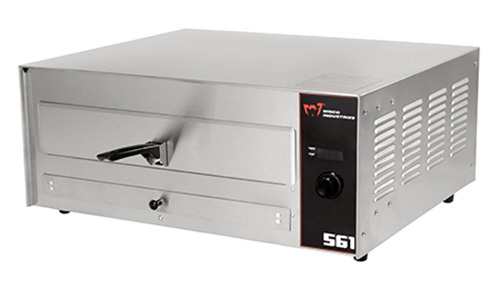 Now, everything from thin, thick, and self-rising pizzas, garlic bread, appetizers, to pretzels, sandwiches, and other food items can be prepared with ease in the 561 pizza oven.